Having a healthy, lush lawn isn’t as difficult as you might think. Follow these easy steps and your lawn will be the envy of the neighborhood. Core Aeration – Core aeration is recommended in the spring and again in the fall. It is best to have some moisture in the soil at the time of aeration. 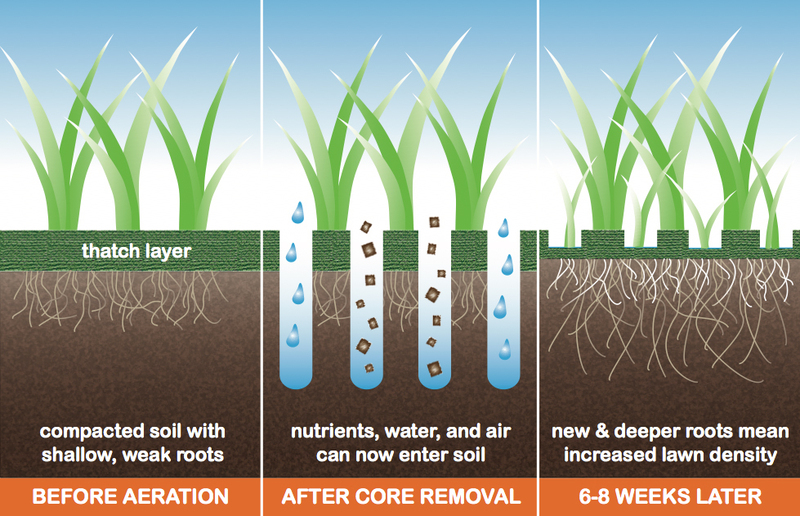 Core aeration is simple, cost-effective and very beneficial to your lawn. It helps to reduce soil compaction, promote root growth and reduce a buildup of thatch. Lawn aeration will greatly improve a lawn if scheduled on a yearly basis. Aeration allows water and fertilizer to get down to the root zone. It will help to reduce the thatch layer which blocks water, oxygen and fertilizer from penetrating to the root of the plant. Early Spring – late March to mid-April. This is the ideal time to include a pre-emergent application on your lawn. Pre-emergents create a gaseous barrier that prevents annual weed seeds from germinating. If you plan to overseed or reseed areas of your lawn, avoid using a fertilizer that contains a pre-emergent. Otherwise, your lawn seed will not germinate. If you plan to aerate the lawn, do so before applying pre-emergents. Aeration after application will reduce the effectiveness of the pre-emergent, significantly. Late Spring – late May to mid-June. Choosing a fertilizer that contains a broadleaf weed herbicide can be helpful, at this time. It will take care of those pesky dandelions and thistles. Mid-Summer – mid-July to mid-August. Like the previous application, a fertilizer with a broadleaf weed herbicide will continue to protect your lawn from dandelions. Fall – late September to mid-October. A winterizer is ideal at this time. 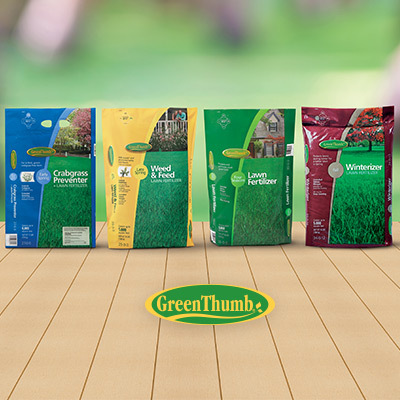 Lawn Winterizers are designed to release nutrients slowly, prepare your lawn for the harsh weather to come and build sturdy, healthy turf. This is the most important fertilizer application to protect your lawn and shouldn’t be missed. Under normal circumstances , 1 inch of water per week is sufficient to maintain your lawn. Apply 1/2 ” of water at each watering. During consistent extreme heat, 1 ½ inches of water per week is ideal. Apply 3/4″ of water, twice weekly during these times. Check your watering system by running a zone for your allotted time and measure your output by putting out some shallow containers. Adjust your time to allow for adequate water output. Early morning watering is preferred, before 10 a.m. if possible. Watering in the mid-day heat means much of the moisture will be lost to evaporation. Evening watering can contribute to the risk of fungal disease in the lawn and garden. Adjust your mower height 2 to 3 inches and keep blades sharp. A well maintained mower can make all the difference. 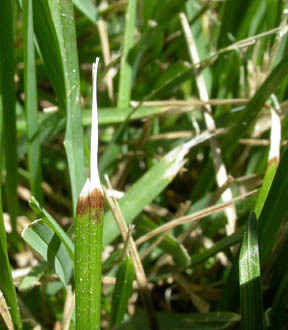 Dull blades shred the grass tips, creating stress. 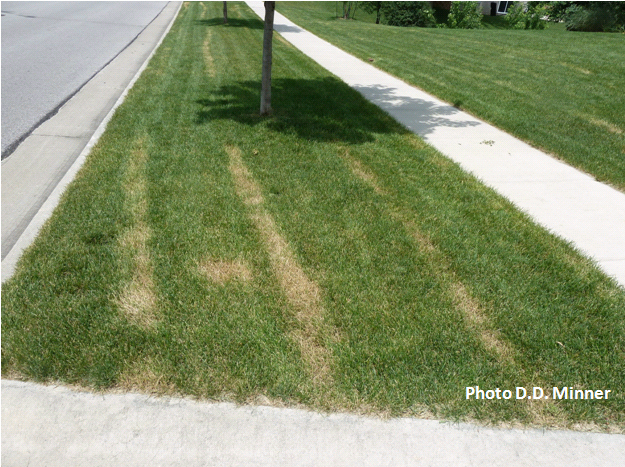 Stressed lawns are easy targets for disease and insects. 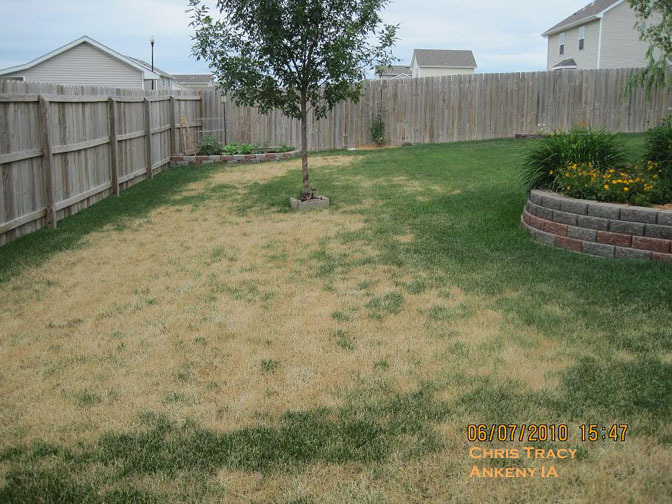 The most common fungal disease in lawn is Ascochyta Leaf Blight. It is caused by drought stress or inefficiencies in irrigation systems. Ascochyta is a fungus that lives on the leaf blade. It enters the leaf blade through the cut end (when you mow). It causes the blade to turn a straw color and wither to a point. It seems to coincide with periods of cool weather followed by hot, dry conditions. Fungicides are ineffective on Ascochyta – focus on irrigation system. Look for broken or tilted heads, adjust the spray/arc of your sprinkler stream to get more uniform coverage and water appropriately. If you are trying to control and suppress any kind of fungal disease in your lawn it is recommended that you use an organically based fertilizer that is lower in slow release nitrogen.